Ford's Transit Connect is a small van - with big ideas. It must suit buyers in both small and compact sectors of the LCV market - and does so thanks to the choice of both short and long wheelbase bodystyles and a versatile loadbay. This revised version gets a smarter look, a classier cabin and a more efficient 1.5-litre EcoBlue diesel engine. Overall, there may be prettier little vans, but there are few more practical ones. It was the Transit Connect that really galvanised the small van sector when it was launched in the UK back in 2003. A whole host of copycat rivals - Citroen's Nemo, Peugeot's Bipper and Fiat's Fiorino - quickly followed. But despite tough competition, this Ford has continued to find a ready band of buyers. The Blue Oval brand says that's because, unless its competitors, it uses fewer car-derived components in its construction, leading to a less compromised commercial vehicle result. Originally, this design had to cover both small (think Peugeot Bipper or Citroen Nemo) and compact (think Citroen Berlingo or Renault Kangoo) sectors of the LCV market, segments covered by other brands with two separate models. That was a bit of a stretch. 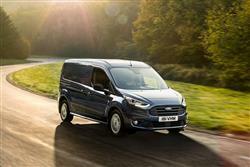 These days though, Ford too, has separate models to offer, with the little Transit Courier slotting in beneath this Transit Connect to form a four-strong Transit offering for UK van buyers. You don't buy any van prioritising ride and handling but with Ford's strong reputation in this department when it comes to passenger cars, then it's fair to expect this Transit Connect to dynamically, be one of the class leaders. Which broadly, it is. Like any LCV, this one handles better fully loaded, but even in the unladen state, cornering response is predictable and bodyroll well controlled. Once you've dropped off your load, you could even imagine rather enjoying yourself on the way home around the twisty stuff in one of these. To a point. Of course, to a certain extent, you'll be limited by the modest output of the new 1.5-litre EcoBlue diesel powerplant that most Transit Connect customers go for. There's also an improved 1.0 Ecooost petrol engine option with 100PS. An upgraded six-speed manual transmission is now fitted to all engines as standard and the 1.5-litre EcoBlue engine (offered with 75, 100 or 120PS) can also be specified with an advanced new eight-speed automatic transmission, which has been engineered to deliver smooth, swift gearshifts. If you're towing, then the top diesel's the variant to choose, offering a braked trailer towing capacity of up to 800kg. Depending on the variant you choose, the turning circle is between 11 and 11.9m. There's plenty of hi-tech here as well. Safety-wise, the Electronic Stability Program (ESP) is standard across the entire range, plus there's Hill Launch Assist to stop you drifting backwards on uphill junctions, Anti Lock Brakes with Hydraulic Brake Assist, Active Yaw Control (that assists with oversteer and understeer), Roll Movement Intervention (to reduce body roll) and, if the worst comes to the worst, Roll Over Mitigation. From the outside, it's clear that Ford's development team have prioritised function over form in this design. So though the front end is these days sleeker and smarter, the overall look is still very boxy and practical-looking. Styling changes made to this revised model adopt the latest Ford design DNA. 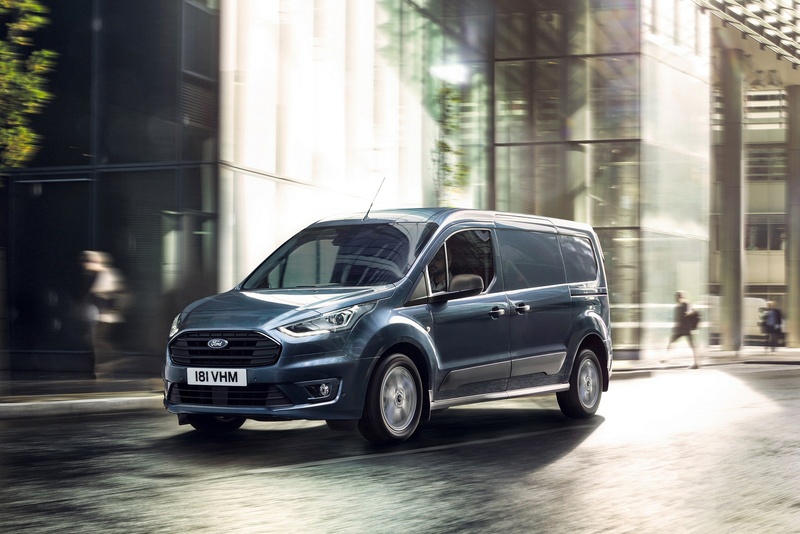 An imposing three-bar Transit grille combined with slimmer headlamps - with powerful HID Xenon lamps and LED daytime running lights available on high series models - combine with a more aerodynamic lower fascia and front spoiler to deliver a fresher look. Inside, where build quality from the Turkish factory remains solid, it's much as before, though there's now a wider use of switchgear and design cues from plush Ford passenger car models like the S-MAX. 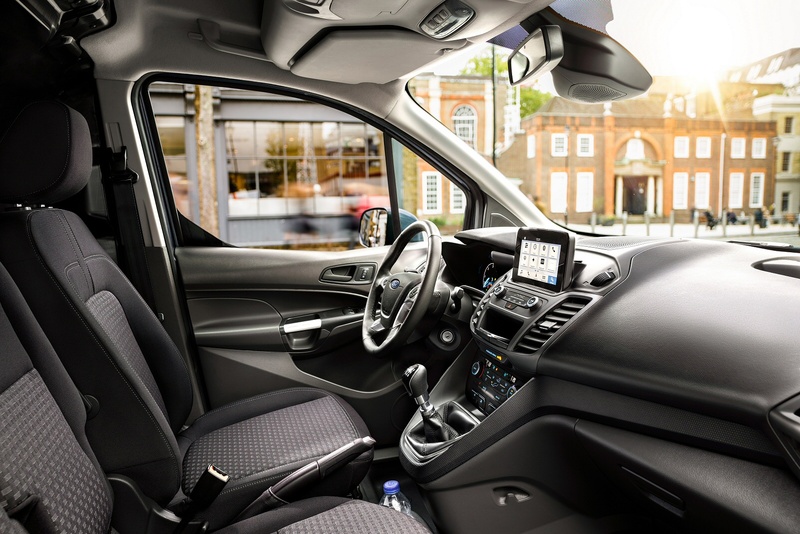 The upgraded cabin features a revised instrument panel with a new central control area that incorporates a floating, tablet-inspired six-inch colour touchscreen on high series models, featuring Ford's SYNC 3 communications and entertainment system. New trim materials provide a stylish and hard-wearing working environment for long working days in the cab. Getting comfortable at the wheel is easy thanks to a steering wheel adjustable for both reach and rake. And there's plenty of cabin storage space. Though it's difficult to know where you would put a sandwich box, a flask or a big bottle of water, there are compartments both in front of the gearstick and behind the handbrake, then between them in the centre area between the seats, a holder for coins and tokens and two large cupholders, narrow bins in each door, a lidded glovebox, an optional tray under the front passenger seat and a shelf at the top of the facia capable of holding A4 documents. Oh and a curry hook for your Friday night takeaway. A load-through hatch in the bulkhead and fold-flat passenger seat enable long loads up to 3.0m (L1) and 3.4m (L2) to be safely carried in the vehicle. In addition, a multi-fold dual passenger seat now enables van models to carry up to three people in the cab. Pricing starts at around £16,000 excluding VAT and there's a premium of around £1,000 to go from the 'L1' short wheelbase bodystyle to the 'L2' long wheelbase version. If you're looking to carry people as well as packages, there's a 'Double Cab-in-Van' option with a fold-out rear bench. Or you could go for a full Kombi version with proper rear seats. Trim levels run from 'Base' (where there's the option of a frugal 'ECOnetic version) to 'Trend' and on to 'Limited' and 'Sport'. Whichever Transit Connect you choose, equipment levels run to a reach and rake-adjustable steering wheel, see-you-home lights that stay on at night to guide you to your front door, remote central locking that allows you to lock and unlock the cab and load area separately, Hill-Start Assist to stop you drifting backwards on uphill junctions, a full steel bulkhead and a sliding side door. There's also a DAB digital radio, a trip computer and steering wheel stereo controls. This revised model introduces a comprehensive range of segment-first driver assistance features, including an Intelligent Speed Limiter - that enables automatic adjustment of maximum vehicle speed to remain within legal limits. There's also a Pre-Collision Assist with Pedestrian Detection emergency braking system, Side Wind Stabilisation and Active Park Assist that helps to steer the vehicle into both parallel and perpendicular parking spaces. If you�re looking for a new Ford Transit Connect 200 L1 Diesel 1.5 EcoBlue 75ps Trend Van for sale, you�ve come to the right place. 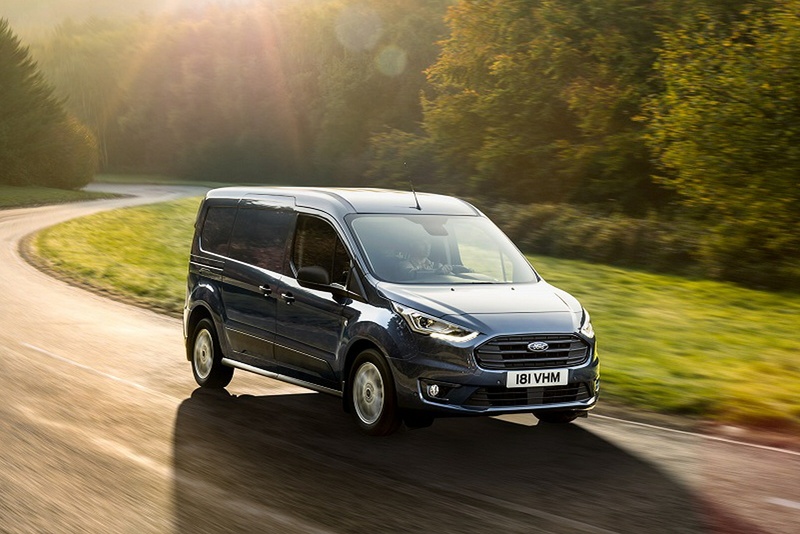 At Bristol Street Motors we don�t just have the best Ford Transit Connect 200 L1 Diesel 1.5 EcoBlue 75ps Trend Van deals, we also offer friendly advice and help with all your enquiries to ensure your buying experience is a happy experience.